The views from Heavenly Mountain Resort's Round-A-Bout trail are nothing short of spectacular. Stellar views of Lake Tahoe are among the highlights of an annual run up the slopes of Heavenly Mountain Resort this weekend. Heavenly Mountain Run’s nearly six-mile course includes the ski resort’s Round-A-Bout trail, from which Lake Tahoe’s blue expanse spreads for miles into the distance. The run takes place the morning of Sunday, Sept. 6. Bryan Rickards, director of operations for event organizer Big Blue Adventure, said the views, as well as the amenities available at the end of the run, are part of what distinguishes the run from other trail running events in the area. “I think the Heavenly run (gives) some of the best views of the lake,” Rickards said. The former Heavenly ski patroller knows the route well and can personally vouch for the course’s benefits. With more than 2,500 feet of elevation gain, the run does present a challenge to participants. “Any time you run up a ski resort you’re going to have some steep inclines,” Rickards said, noting the course does feature flatter sections and rolling parts in addition to its climbs. Onsite registration for Sunday’s run is $61 for adults, $52 for those 62 and older and $48 for those 18 and under. Registration will be available on the day of the event and begins at 8 a.m. at Heavenly’s California Base Lodge. The race is scheduled to start at 10 a.m. Mountain-top activities and post-race meals at Tamarack Lodge are scheduled for 11:30 a.m. to 3 p.m. The Heavenly Mountain Run is part of the Big Blue Adventure’s Tahoe Trail Running Series. 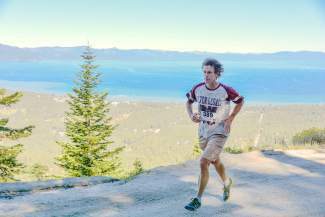 The next stop in the series, the 12K Emerald Bay Trail Run, takes place Sept. 19. This year’s series concludes with the Lederhosen 5K and 10K at Squaw Valley Sept. 26. For more information, visit http://www.tahoetrailrunning.com/trail-runs/heavenly-mountain-run.